2. 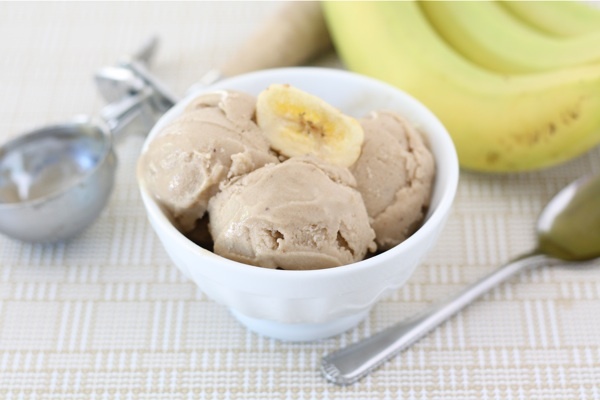 Place the banana slices in a food processor or powerful blender. Puree banana slices, scraping down the bowl as needed. Puree until the mixture is creamy and smooth. Add the peanut butter and puree to combine. Serve immediately for soft-serve ice cream consistency. If you prefer harder ice cream, place in the freezer for a few hours and then serve. *Note-if you have a hard time creating a creamy consistency, you can add 1-2 tablespoons of milk to help puree the banana slices. Make sure you use a powerful food processor or blender!